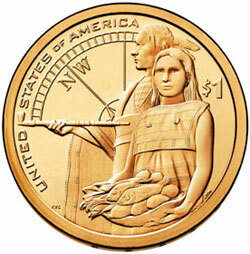 The mintage levels for the Native American Dollars have been at both extremes during the course of the series. After initial production at high levels, the most recent issues have seen production at extremely low levels. The production levels for circulation strike versions of the series have in large part been driven by the production of Presidential Dollars due to a provision within Public Law 110-82. The law required that the number of coins minted and issued with the Native American Dollar design shall not be less than 20% of the total number of $1 coins minted and issued for the year. From 2009 to 2011, the Presidential Dollars were struck and distributed for circulation across four different designs. During these years, the 20% requirement resulted in correspondingly high production for Native American Dollars. From 2012 onwards, the production of Presidential Dollars for circulation was suspended, resulting in a corresponding drop in production for Native American Dollars. The highest mintage for the series occurred for the 2010-D issue, which saw total production of 48.72 million pieces. The lowest mintage occurred for the 2013-P and 2013-D issues, which saw production of 1.82 million pieces each.